NONE LESS THAN ANSEL ADAMS said that Vittorio Sella’s photographs inspired “religious awe”. Sella was born in 1859 in Bielle, Italy, in the shadow of the Alps, and he began climbing at an early age. He was the first to climb the Matterhorn and the Monte Rosa, Italy’s highest peak, in winter and the first to traverse Mont Blanc in winter, too. That prowess enabled him to haul the bulky large-format camera and gear of the day, including the fragile 30x40cm plates upon which the image was formed. Sella passed away in 1943. His work is represented in the States by Panopticon Gallery. 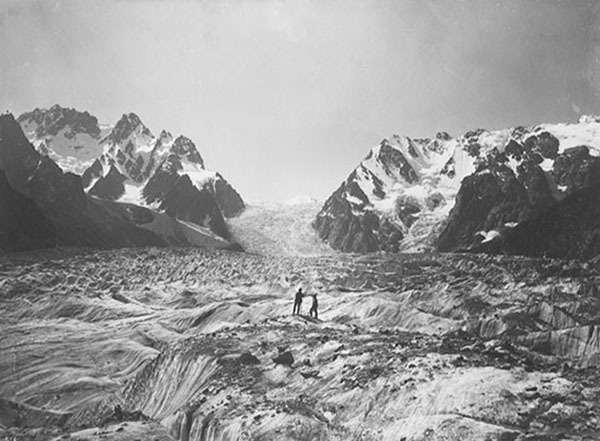 You can also see a stunning collection of his images in the books Summit : Vittorio Sella : Mountaineer and Photographer : The Years 1879-1909 and Frozen in Time: The Mountain Photography of Vittorio Sella. Not just the big camera and wooden tripod, but think how much an 11″x14″ box of glass would weigh!